Poland is located in central Europe. Poland is bordered by the Baltic Sea, Germany to the west, Czech Republic and Slovakia to the south, and Ukraine, Belarus, and Lithuania to the east. 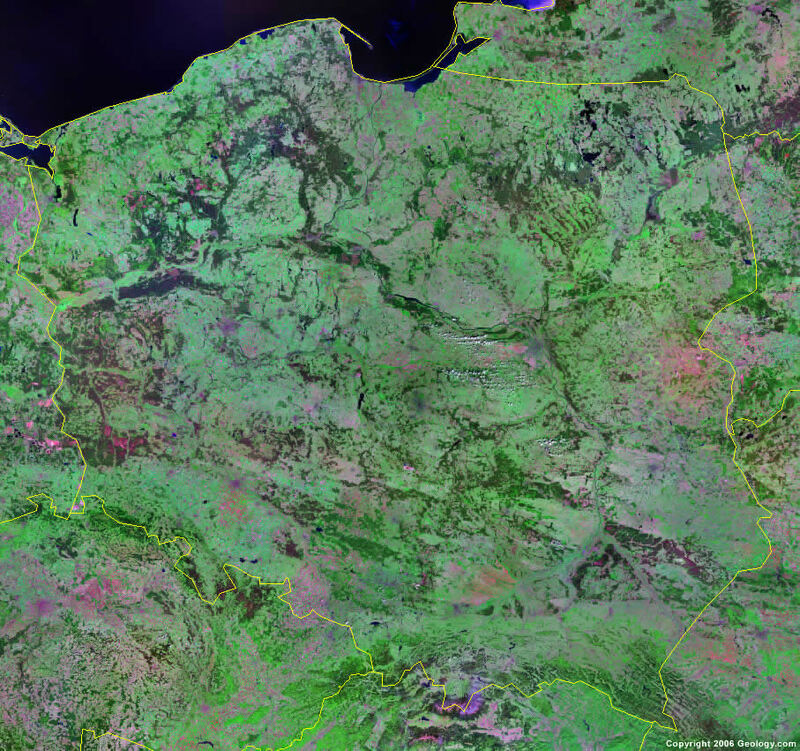 Google Earth is a free program from Google that allows you to explore satellite images showing the cities and landscapes of Poland and all of Europe in fantastic detail. It works on your desktop computer, tablet, or mobile phone. The images in many areas are detailed enough that you can see houses, vehicles and even people on a city street. Google Earth is free and easy-to-use. Poland is one of nearly 200 countries illustrated on our Blue Ocean Laminated Map of the World. This map shows a combination of political and physical features. It includes country boundaries, major cities, major mountains in shaded relief, ocean depth in blue color gradient, along with many other features. This is a great map for students, schools, offices and anywhere that a nice map of the world is needed for education, display or decor. If you are interested in Poland and the geography of Europe our large laminated map of Europe might be just what you need. It is a large political map of Europe that also shows many of the continent's physical features in color or shaded relief. Major lakes, rivers,cities, roads, country boundaries, coastlines and surrounding islands are all shown on the map. Biala Podlaska, Bialystok, Bielsko-Biala, Bydgoszcz, Chelm, Ciechanow, Czestochowa, Darlowo, Elblag, Gdansk, Gdynia, Jelenia, Kalisz, Katowice, Kielce, Kolobrzeg, Konin, Koszalin, Krakow, Krosno, Legnica, Leszno, Lodz, Lomza, Lubawa, Lubawskie, Lublin, Malbork, Morag, Nowy Sacz, Nowy Targ, Olsztyn, Opole, Ostrateka, Ostroda, Pila, Piotrkow Trybunalski, Plock, Poznan, Przemysl, Radom, Rzeszow, Siedlce, Sieradz, Skierniewice, Slupsk, Suwalki, Szczecin, Tarnobrzeg, Tarnow, Torun, Ustka, Walbrzych, Warszawa (Warsaw), Wielkopolski, Wloclawek, Wroclaw, Zakopane, Zamosc and Zielona Gora. Baltic Sea, Bug River, Carpathian Mountains, Gulf of Gdansk, Jezioro Dabie, Jezioro Druzno, Jezioro Jeziorak, Jezioro Lasmiady, Jezioro Lebsko, Jezioro Mamry, Jezioro Miedwie, Jezioro Nidzkie, Jezioro Sniardwy, Jezioro Wigry, Kaliningradskiy Zaliv, Narew River, Neisse River, Notec River, Oder River, Vistula River, Warta River, Wista River, Zalew Szecinski and Zatoka Pucka . Poland has fuel deposits, some of which are coal and natural gas. Mineral resources for this country include sulfur, copper, silver and lead. Other important natural resources include amber, salt and arable land. There are natural hazards in Poland, including flooding. The environmental issues for Poland have improved since 1989 due to the decline in heavy industry and an increased environmental concern by the post-Communist government. The pollution levels should continue to decrease as industrial establishments bring their facilities up to EU code; however this is at substantial cost to businesses and the government. Nonetheless, air pollution remains serious because of sulfur dioxide emissions from coal-fired power plants, and the resulting acid rain which has caused forest damage. The water pollution from industrial and municipal sources is also a problem, as is disposal of hazardous wastes.